The fungi kingdom, or mushroom kingdom, makes up its own kingdom because fungi are not animals, and fungi are not plants. Fungi and mushrooms do not photosynthesize and instead derive their energy from the decaying organic matter which supports them. This means they are not dependent upon the sun like most plants. 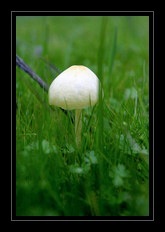 This doesn't mean that all wild mushrooms grow in dark caves, however. For many fungi and wild mushrooms of the fungi kingdom the sun and the warmth it provides are essential to their life cycle. Additionally, many of the fungi kingdom live as parasites to living hosts which require sunlight to grow, and others live in a relationship with sun-loving hosts which is mutually beneficial to each (these fungi are called mycorrhizal fungi). What does all that mean for someone hunting wild mushrooms for mushroom photography to create wild mushroom art prints from those mushroom photographs? It means that on your search for your elusive wild mushroom art subjects part of your time will be spent shivering while peering into a cold, damp, dark and moldy corner of decaying stumps, but you may also find yourself out in sunny spring meadows or strolling through springtime oak savannas. Visit the online gallery to browse Mushroom Artwork for sale as fine art prints, photo prints, greeting cards, canvas prints and other artwork presentation formats ready to hang gallery style. Above is one of the wild Mushroom Art Prints for sale by artist C Ribet at the C Ribet Zenfolio gallery section devoted to Mushroom Art and Fungi Photos. 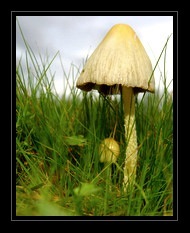 Click on the Mushroom art photograph above to be transported to the gallery section on Mushroom and Fungi artwork.